Sony and From Software don't plan on developing Demon's Souls 2 right now, so what does that mean for Project Dark? From Software and Sony revealed some sad news this week for action-RPG fans. Reportedly, the companies have no plans to develop Demon's Souls 2 and any chance of a sequel to 2009's sleeper hit is still up in the air. However, that doesn't mean we won't be getting more of the first title's impossibly good gameplay. From Software director Hidetaka Miyazaki and Sony of Japan's Takeshi Kajii recently revealed in an interview with the Guardian that despite the smashing success of Demon's Souls that made big profits for Atlus USA, the studio still isn't working on Demon's Souls 2. When asked if there would be a sequel, Kajii said: "At the moment, my answer is 'no sequel!'" Did he really have to put an exclamation point on it? Kajii continued: "However, we have been encouraged by all the players, and this title is so well supported, and besides we like this title so much... Well, this is my own feeling, but I think one day we could bring you another Demon's Souls." Either Kajii is being coy or there's an issue at hand in regards to creating a sequel. Could it be the fact that From Software has already announced a game called Project Dark that looks exactly like Demon's Souls? I mean, seriously, look at this early footage of Project Dark shown at the Tokyo Game Show. It's the exact same game, no? From what we can see, Project Dark replicates the same art style, dark fantasy setting, and combat. 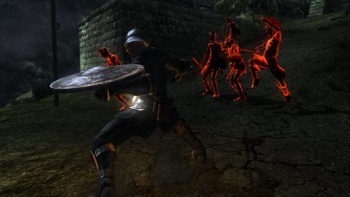 Project Dark is known to be a multiplatform title releasing worldwide in 2011, so the real problem could be that From wanted to double the success of future Demon's Souls titles by bringing them to the Xbox 360 in addition to the PlayStation 3, but wasn't able due to the game's ties to Sony. Considering that Miyazaki deferred the question about Demon's Souls 2 to Kajii, saying "I will let Mr Kaiji answer that question," From Software may not be involved with an official sequel at all, but that's pure speculation.